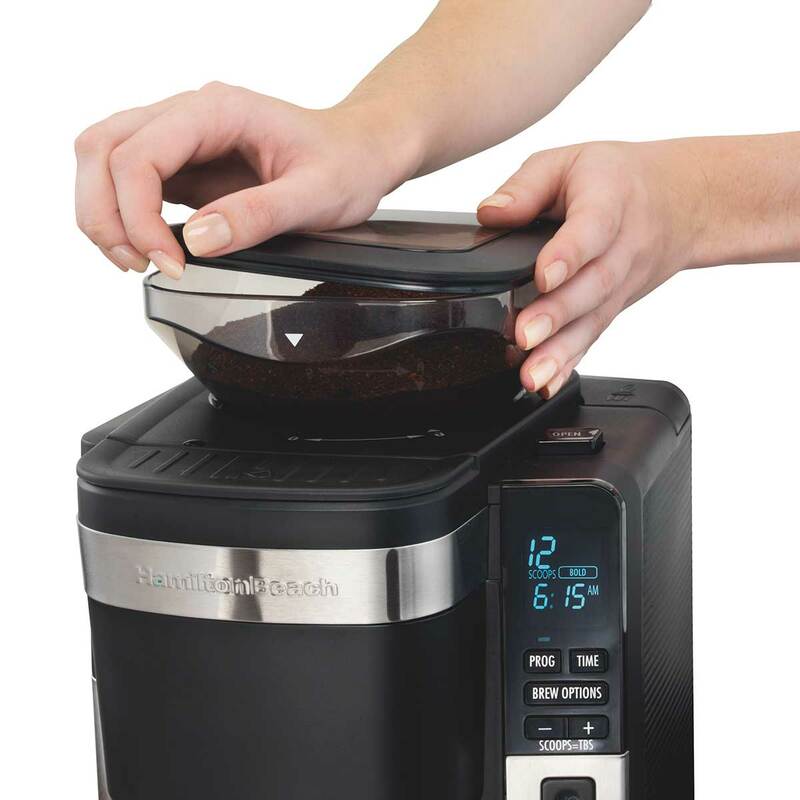 Streamline the brewing process and get consistent coffee flavor. 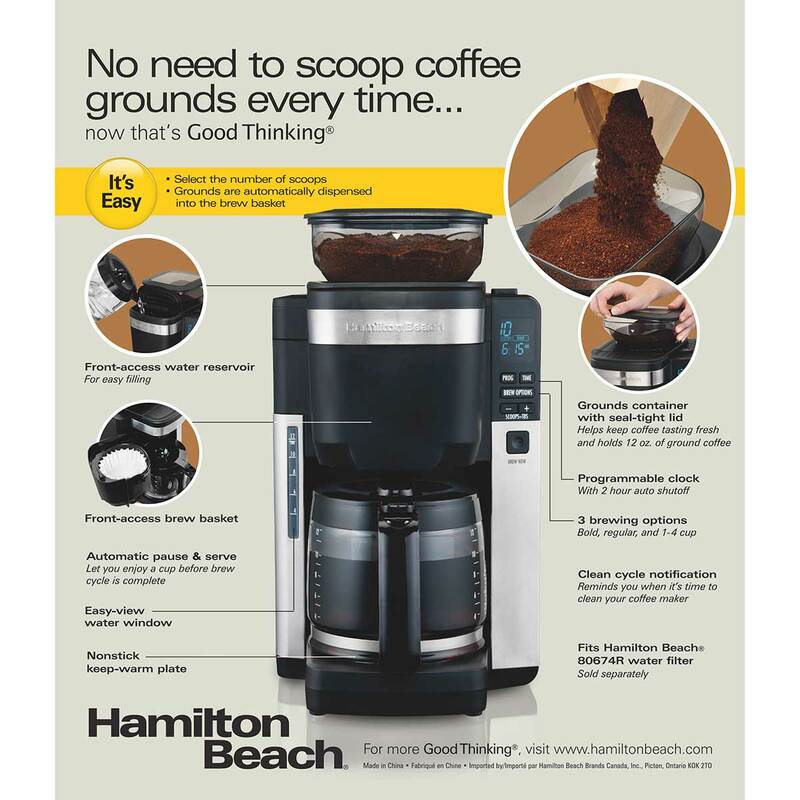 With the Hamilton Beach® Auto Grounds Dispensing Coffee Maker, making coffee just got a whole lot easier. That’s because your grounds are automatically measured and dispensed into the filter with just a touch of a button. Plus, it remembers your scoop number so there’s no need to set it daily. That means you can get the same flavor and strength every time – no matter who makes it. 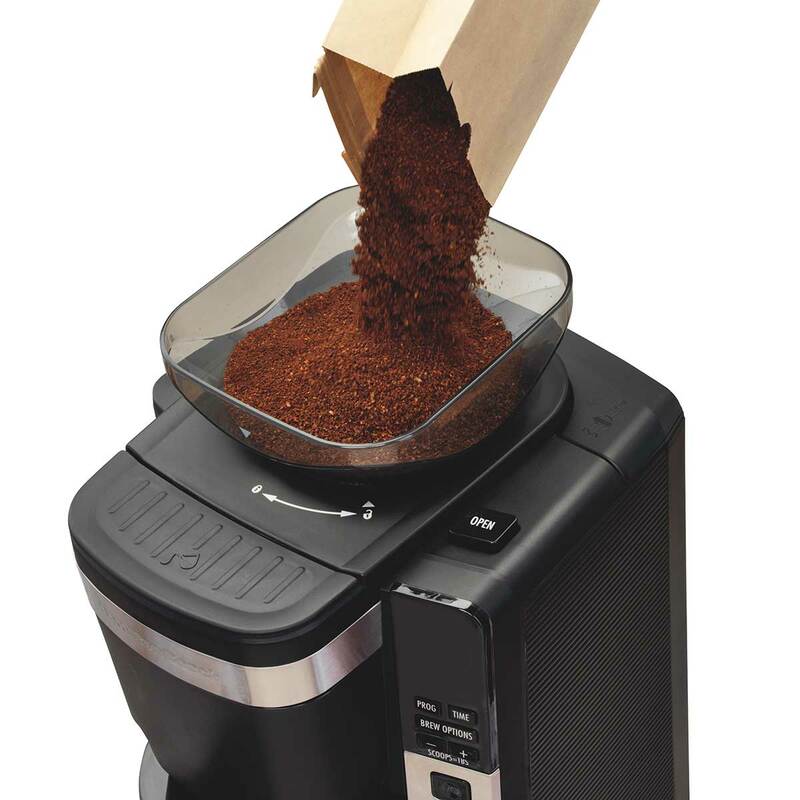 The attached grounds container seals tight to help keep coffee fresh, and it holds up to 12 ounces of grounds. 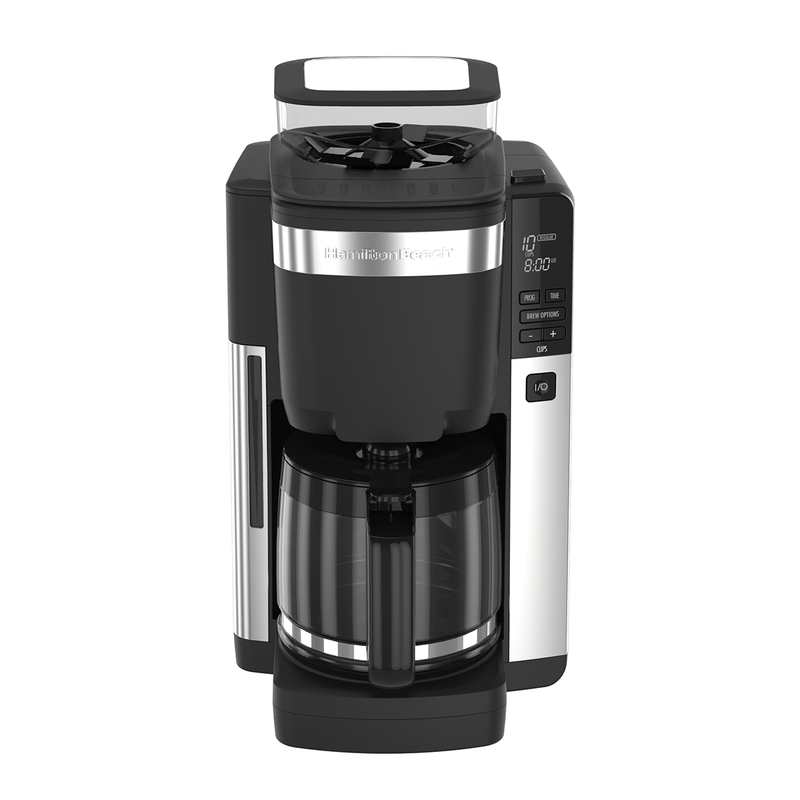 The coffee maker’s compact design makes it small enough to still fit under most standard cabinets, but it can brew up to 12 cups. 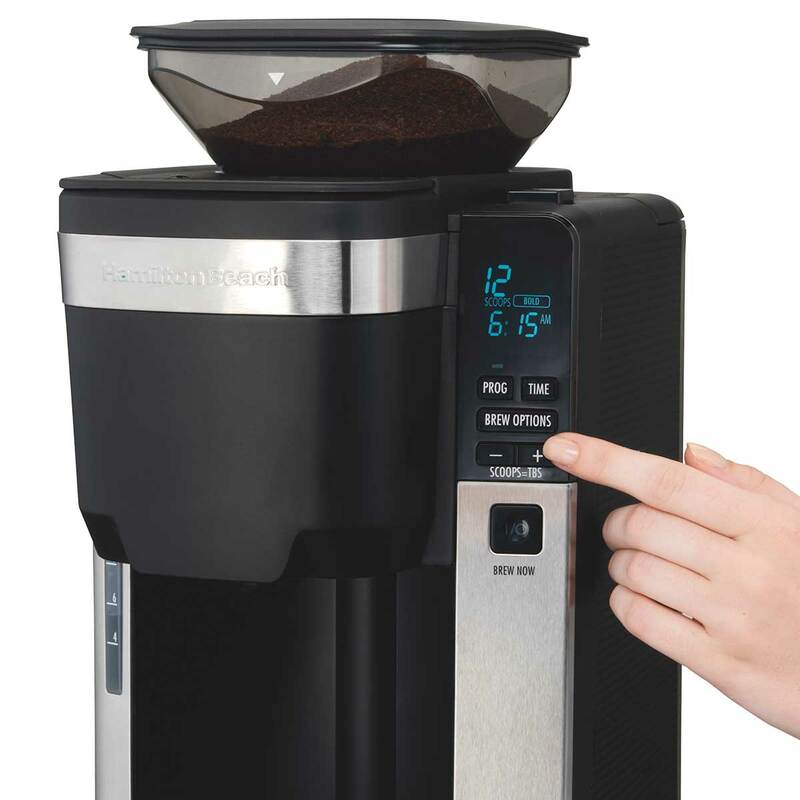 While the Auto Grounds Dispensing Coffee Maker gives you consistent results, it also offers smart, flexible features, like programmable settings, three brewing options –regular, bold and 1-4 cup – and automatic pause and serve. 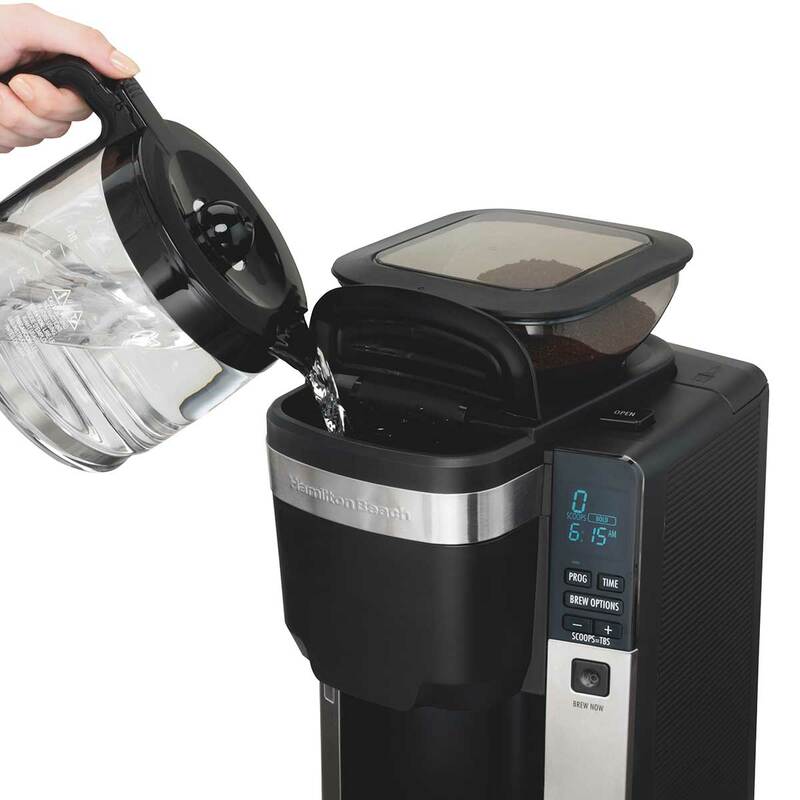 A front-access water reservoir makes filling easier, and the swing-out brew basket has a sensor to let you know when the coffee basket needs to be cleaned out, so you won’t accidentally fill a used filter. 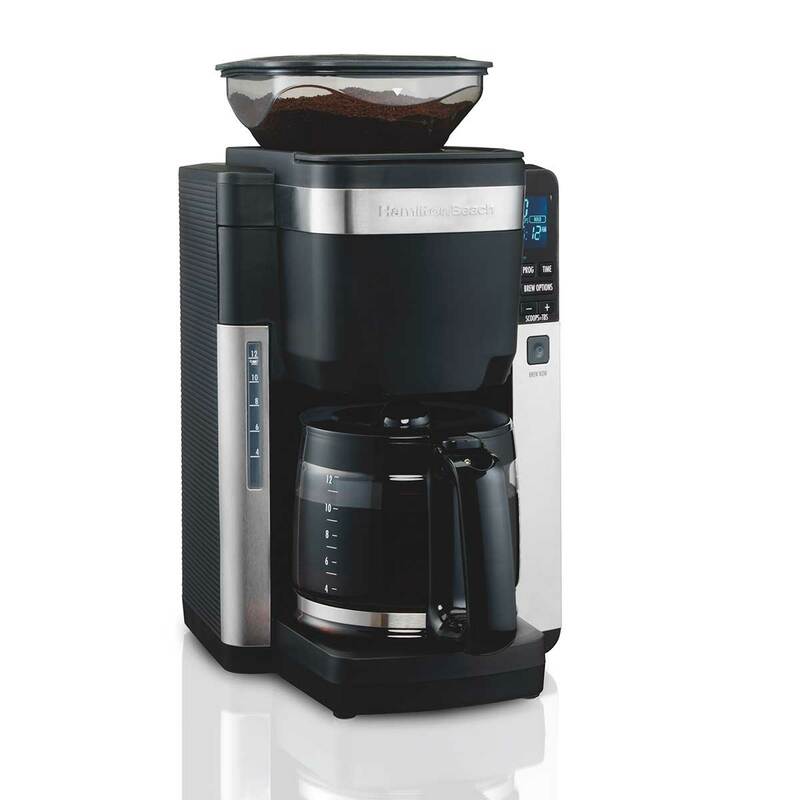 Plus a cleaning cycle reminder lets you know when it’s time to clean your coffee maker. This coffee maker stores and dispenses the grounds for you and remembers the scoop number you previously selected. 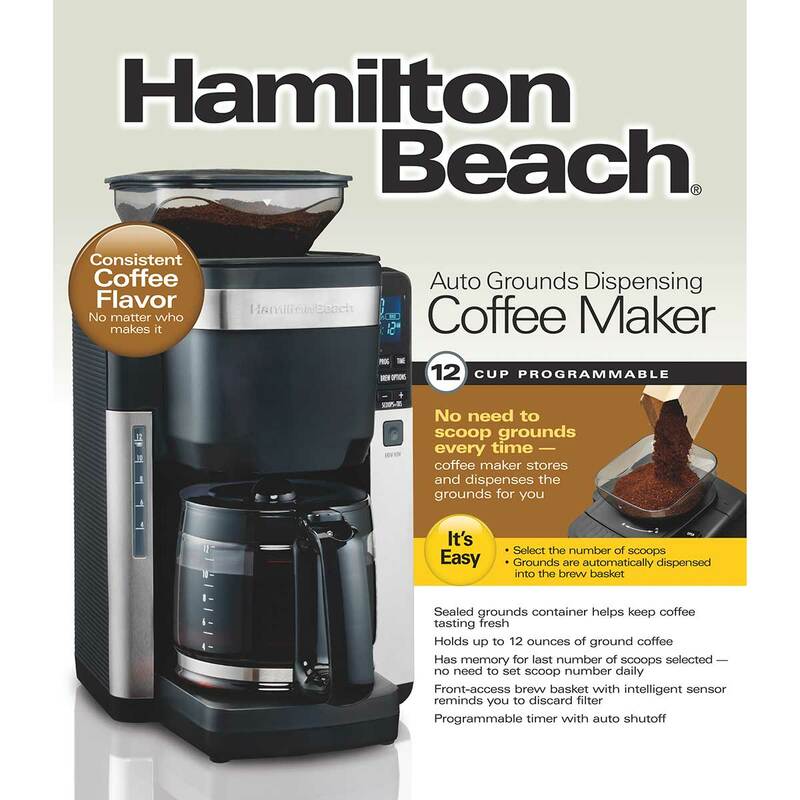 Store up to 12 ounces of ground coffee – the sealed container keeps coffee tasting fresh. Trust anyone to make the coffee the way you prefer - just select your preferred scoop number, add water and brew. 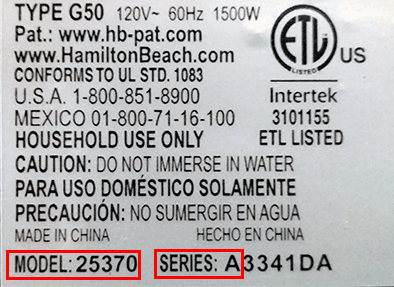 Fill the water reservoir from the front of the coffee maker, not the back. View water levels in the window that’s on the front. 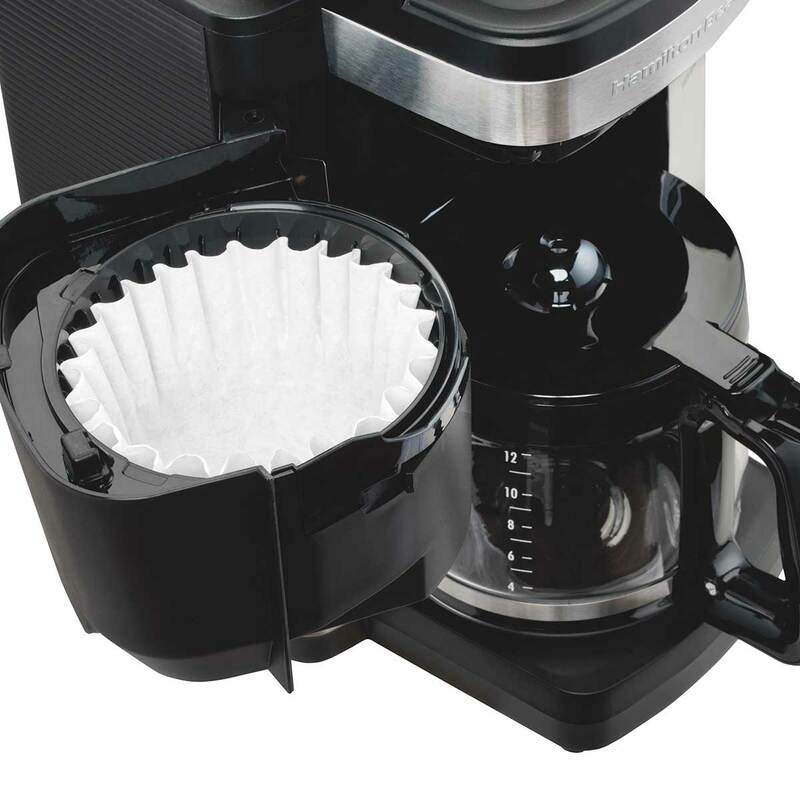 Brew basket opens with a push of a button, and an intelligent sensor alerts you if the basket needs to be cleaned out before dispensing grounds, so you never have to worry about accidentally auto filling into a used filter. Programmable timer with auto shutoff and optional clean cycle reminder. Brewing options include regular, bold, and 1-4 cups. Place grounds container into opening, aligning arrows and turn clockwise until you hear a click. Pour up to 12 ounces of ground coffee – store-bought or beans you’ve already grounded – into the container, then seal the lid to keep coffee tasting fresh. Select your desired number of scoops and brew strength and fill the reservoir with water. No need to set scoop number daily; memory retains last number of scoops. Choose from regular or bold brewing strength to personalize the taste even more. A special setting for 1 to 4 cups ensures a small batch tastes just as good as a full carafe.